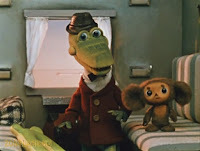 The ever peripatetic Messy Nessy Chic makes us a touch nostalgic with the reminder of the character Cheburashka (Чебура́шка)—who was originally featured in a children’s book by Eduard Uspensky (*1937 – †2018) in 1966 and popularised by a stop-motion animated film series by Roman Abelevich Kachanov. Unknown to science—a sort of hybrid between a monkey and a bear cub (three-toed, tailless Monchhichi, I’d classify him but he was also known under the export market name of Topple), Cheburashka was a stow-away on a crate of oranges that ended up in Moscow, where he befriends Gena Crocodile and has adventures. Below is the opening and some of the incidental music from the scores by composer Vladimir Yakovelvich Shainsky (*1925 – †2017).